Omaha Fashion Week finale is in less than two weeks! Buy your tickets if you haven't already... Here is a cool Omaha Fashion Week Groupon deal, if you are interested in that. The next two weeks are all about sewing, final pattern drafting, model fittings, styling the collection and mixing the music. Each garment requires a lot of time and care to make so there really isn't a spare moment. 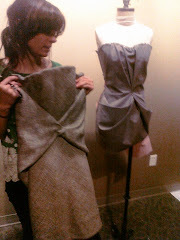 I will keep posting photo updates of my process until show time. There are so many little decisions to be made. I hope I can pull it all together! Back to sewing for Emma.